Stock indices struggled throughout the week with the S&P 500 dropping -2.1% with fear of Fed tapering resurfacing. In the week ahead, there are several events with the potential to move the markets including Wednesday’s FOMC meeting. Another market moving event is the European Union’s Single Supervisory Mechanism (SRM) deal. The SRM is a detailed plan for how to deal with and fund troubled EU Banks. The SRM is believed to be the EU’s first viable attempt to start fixing its banking system and provide reliable funding source. I will also be on the watch for any news from China, both economic data and the rising tensions with Japan regarding the Senkaku Islands. To read more and access the entire article click here. This week’s busy economic calendar should provide opportunities in the global financial markets. 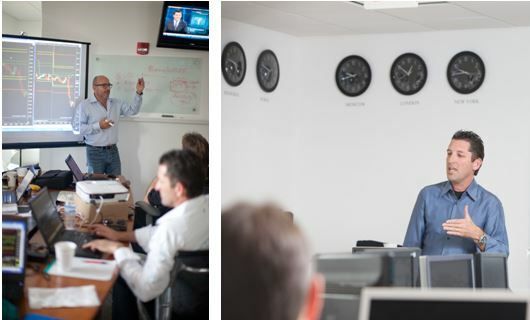 Join us in our live trading rooms, including the TradeLAB, ABC Trading and Rios Quant Trading En Espanol. The links to access the rooms are provided below for your convenience. Access our blog The Trading Room and visit us on FaceBook. Please take note of this week’s schedule at a glance including key economic reports that might have an impact on the markets. Live trading rooms and educational events are also listed with the appropriate links for gaining access. While some of the events are free, others are for members only. Let us know if you have an interest and we will provide you with all the pertinent information. RQ trade coaches include Edward Preston, Steve Schwartz and Joe Rios. Live demonstration of our pre-market quantitative analysis, real-time trading signals with RQ algorithmic technology, strategy performance review and Q&A session. Únete a nuestro coach de trading, Xavier Carrero mientras lo guía por el sistema de trading algorítmico Rios Quant en un entorno de mercado en tiempo real. Él va a utilizar la tecnología de trading cuantitativo desarrollada por el Jefe de Estrategias, Joe Ríos. Xavier lo guiará por los mercados utilizando el único sistema de su tipo en el planeta.